Two years before the 2011 Oscar-winning divorce drama A Separation, the director and very good screenwriter Asghar Farhadi made a mind-games thriller called About Elly. It’s just been released in the United States and is making its way around the country. About Elly doesn’t seem like much of a title, I know. Gradually, though, you get hung up on the “about” part. It’s not because Elly (Taraneh Alidoosti) is inherently fascinating. She’s mild and reserved in the way you would be if you’d received a last-minute invitation to be the guest of strangers. It’s more because once Elly vanishes, her absence provokes questions that prove difficult for her hosts to answer with certainty. I’ve never seen gestures of kindness and inclusion presented the way Farhadi does here: as selfishly cruel. The hosts are college friends: three youngish married couples, with three small children, and Ahmad (Shahab Hosseini), who’s handsome, unattached, and briefly home in Tehran from Germany, where he now lives. It occurs to Sepideh (Golshifteh Farahani) to invite Elly in order to set the two of them up. According to Sepideh, Elly hasn’t been told about the invitation’s ulterior motive. Would the rest of the group be polite enough not to say too much? All Elly knows is that she’s been asked to spend a weekend with genial, comfortably middle-class people among cottages near the Caspian Sea. Farhadi doesn’t point your attention to any one place in the frame. The action unfolds in a mix of the oblique and direct. This is the fourth of his six movies, and by this point he’s begun to perfect the art of withholding and is close to mastering emotional suspense. That suspense tends to arise from one character’s poor decision — or, in Sepideh’s case, an entire bouquet of them. Within a few scenes, it becomes clear that Sepideh is the one doing all the withholding. Not only has she kept Elly in the dark, but when the group arrives to pick up the key for their rental, the proprietor reminds Sepideh that she told her that the cottage is available for only one night because the owner is due back the following day. But Sepideh twists the woman’s arm with a fib that they’ve come to Chalus to celebrate the marriage of two newlyweds. Her fiction works. Soon everyone is sweeping into an alternative rental arrangement, a gated, vast, threadbare place right on the sea — a beachfront Havisham house. They vote to stay and clean it to make it habitable. In a typical movie, these obstacles are mundane inconveniences. But Farhadi builds them into ethical symposia. Imagine the exasperation of spending the weekend (or a marriage) with someone so indifferent to reality that she concocts her own. Sepideh’s lies are white, but they’re only one unforeseeable event away from darkening and multiplying. Elly’s vanishing does the trick. It’s a niftily disorienting sequence. Elly is on the beach, flying a kite with the kids, and the camera keeps her alone in a tight, medium close-up as she runs, her head tilted ecstatically skyward. The cutting gets jumpy. The resulting effect is that she’s spinning so fast that if she lets go of the kite — or the camera lets go of her — she’ll go flying into the sea. The next shot is from inside the house, where we see the kite sail by, with the expanse of sea in the background. When two of the children run up, screaming that the third has drifted into the water, the men terminate their volleyball match to begin a frantic search. They do a lot of panicked sprinting and swimming and screaming. Eventually, the women join in, while trying to keep their head scarves in place. First they locate the missing kid, and then look for Elly, who’s gone. The ensuing recriminations and second-guessing are to be expected. The couples’ bonds start to warp. Sepideh’s husband, Amir (Mani Haghighi), turns on her. Peyman (Peyman Moaadi, the husband in A Separation) gets snippy with his wife, Shoreh (Merila Zare’i), and their kids. The stress angers the men and sends the women into coughing fits. The vanishing devastates Sepideh. She’s human, of course. She’s also got something that she ought to get off her chest about Elly. Farahani is a beauty capable of both opacity and waterworks. She makes premeditated deception seem like an unhappy accident. It takes a certain daring not to stop there, not to let the search party just rancorously devour itself. But Farhadi keeps peeling the onion. A ninth adult appears, which calls for everyone to debate yet agree to tell more lies, in part for Elly’s honor, in part for their own. This goes for the children as well, who are comically coached in what not to say about Elly. Once what’s going on has been laid out and argued over, none of it seems like such a big deal. But Farhadi makes films about class and domestic propriety in modern Iran, the way they intermingle and poison each other in modern Iran. The opening credits flash by in the darkness of some kind of receptacle. You see paper shoved through the slot, then something magnetized furtively affixed. I didn’t realize that we were likely inside a ballot box until hours after a second viewing. The movie doesn’t return to it. (It also doesn’t explain the loud crash that occurs during that kite sequence or that magnet, which could be an explosive device.) But every time we see the group vote (for where to stay and how to lie), we’re watching Farhadi make a clever, resonant, multipronged argument about democracy in Iran (2009 was the year of a volatile election): It’s wonderful, it’s illusory, it’s palliative. The ethos of religious honor and its maintenance continue to usurp secularity and even notional freedom. There’s only a sliver of light in that box. The film’s immediate, obvious comparison is to Michelangelo Antonioni’s L’Avventura, from 1961. That, too, was the story of a woman by the sea whose disappearance rattles her friends. Antonioni was a black-and-white existentialist, not a dramatist. He did his thinking in images. His way has its advantages. He could mesmerize you with a tracking shot and a close-up. The highlight of that movie is reached anytime the camera finds its way to the sensually remote face of Monica Vitti, who plays one of the friends. The unknowns of that movie are maddening, and yet you accept that its maker was too much of a philosopher to bother with conventional suspense or surprise. Life is question marks and ellipses, not exclamation points. Antonioni was Hitchcock from the temples up. The film feels as if Farhadi saw The Big Chill and said it would have been better as L’Avventura, with the crashing waves standing for the Temptations and Procol Harum. I like Farhadi’s movies quite a lot. They’re arithmetically moral. Every choice adds up — or, given the tragedies under his belt, subtracts. But he prefers characters to explain what the camera — what his camera, anyway — cannot. Here and in his most recent, most ornate film, The Past, this leads to a blitz of last-minute exposition and confessions that are engrossing on the one hand and somewhat inadequate on the other. They don’t quite satisfy the anticipation of the filmmaking that’s led up to it. Farhadi has things happen offscreen or out of earshot, then later reveals, through dialogue, what took place — the explanation of the peeling of the onion. The triumph of A Separation was the cinematic stereo it made of words and action. There, he left you unsure of your own eyes and ears. It was a thriller that refused to explain itself entirely. Farhadi likes to do a lot of telling when you crave more showing. But we don’t understand everything either way. During that kite sequence, for instance, there’s the sound of that crash. Hearing it a second time only compounds the uncertainty. That and the ballot box are tricks with which a director like Michael Haneke would do a little more. But here the ambiguities remain, and Farhadi entrusts us with them. They are human black holes. Even once you know what’s happened to Elly, you really don’t. A dead end here is another grim beginning. The Age of Adaline feels like a new low for vanity films. It’s not just that Blake Lively has to spend an entire movie pretending to be sad that she’ll never age past 30. It’s that Ellen Burstyn has to play Lively’s daughter, and Harrison Ford a man from her past (1966! ), and that every time they see her, some awe or affection has to overwhelm them. They have to be blinded by her. It’s one thing for Joan Crawford or Meg Ryan or Susan Lucci to ask for this kind of treatment. It’s quite another for an actress whose “lifestyle brand” is called Preserve. Lively cuts a long, striding figure and has a stunning face with acute angles (you really could look at her all day), but it’s not a face that expresses much (at the movies, “all day” lasts about two scenes). When Adaline’s car hits the water, it’s explained that she suffers a kind of anoxic seizure and that a half-billion volts and many, many amps of electricity defibrillate her back to life. Sometimes, an accident like that will turn you into the blob. Sometimes, it’s Botox. When that Frontline voice starts up, it usually signals the cosmos reanimating her from a state of hypothermic death. This is unfair to Lively, since it’s as much a job for an actress as for a cadaver. Anyway, Adaline marries, has a daughter, is widowed, and at about 45, wins the suspicion of the FBI, which puts her permanently on the run. She winds up in San Francisco, a city famous for being a place where you can become who you want to be. Who she wants to be is a librarian. (Stacks-chic never fades.) She works at someplace called the Heritage Society, where, in the 21st century, a swarthy, affluent gentleman with a dubious American accent, named Ellis (Michiel Huisman, who’s Dutch), is holding a donation worth $50,000 hostage until Adaline goes out to dinner with him. These are the stakes: Will Adaline — who goes by “Jenny” — stop the lies and settle down or flee? Ford, in a gray goatee and short matching haircut, might look even better at his age than Lively does at hers. He gives off the intangible wattage of a star. It’s a light that never truly goes out. But you have to have it to begin with, and Lively doesn’t quite have it. This is a film that needs Amy Adams’s twinkle or Sandra Bullock’s nervous stammering. It needs a star with life. Her name aside, you rarely feel it from Lively. She does have a specific throwback panache, though. She seems like an exceptionally lucky cigarette girl. What’s the opposite of stealing a movie? Putting it back? Looking the other way? Laziness? Whatever it is, that’s where I am with James Franco. Lately, he’s like a tennis player who can’t put a ball in the service box. The wrong thing comes off him: contempt. It doesn’t come from the characters he plays, but rather is directed at them. He’s judging them before we’ve had a chance to make up our minds. He’s attached to 19 projects as an actor, director, or producer with “2015” next to them. His well-documented busyness may have emptied him out. Or maybe it has emptied me out. Spring Breakers was three years ago, and perhaps the nuclear foolishness of that part — the daring to simultaneously break character and maintain it — has soured him on doing much else as a performer. That was his Scarface, his Mommie Dearest: a breaking point. 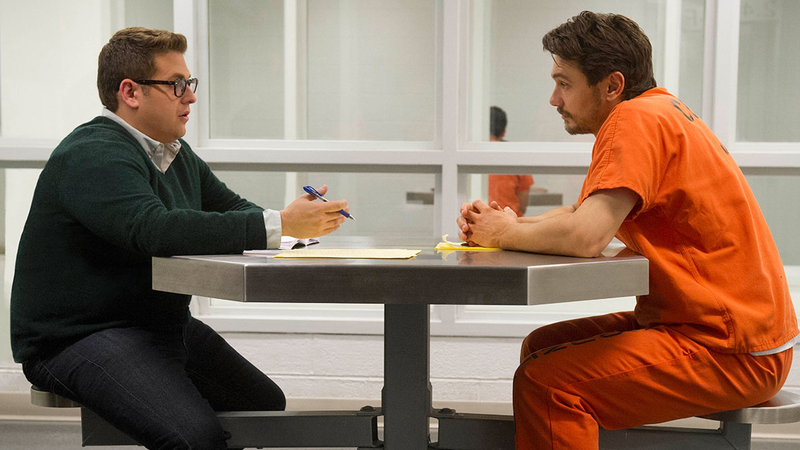 Franco is currently in an orange jumpsuit and scraggly beard for True Story. He looks like a man who hasn’t slept since the last Bush administration. He’s playing Chris Longo, an Oregon man standing trial for the murder of his wife and three children. The film is based on actual events, and it features a handful of prison-visit scenes between Longo and the journalist Michael Finkel, whom Jonah Hill tries to play with some purpose. It’s a lost cause. Franco isn’t the reason this antsy, intellectually clueless movie doesn’t work. But his long face and soft, droning delivery are advertisements for its dreariness. This is one of those reporter-talks-to-killer movies. Hill is even given a pair of black glasses with thick frames to recall Truman Capote. The film purports to be obsessed with the truth, with the power of certainty that reporting the news bestows upon a writer. At the start of the movie, Finkel stands guilty of abusing his power, having fabricated details in a story about African laborers. He’s dismissed from his job at The New York Times Magazine and heads to Montana to mope near his girlfriend, Jill, who, mysteriously, is played (with a hard American accent) by Felicity Jones, who must surely be tired of doing the acting equivalent of changing bedpans. Locked out of journalism, he’s almost delighted to hear that Longo was apprehended having stolen Finkel’s identity. He smells a comeback. HarperCollins is on speakerphone. Longo sends him reams of personal history and, it must be said, serial-killer sketches, all of which Finkel tacks up around Jill’s big, handsome house the way a detective would in any homicidal-maniac movie. It’s obvious in their first meeting that these two, as played by Hill and Franco, are made for each other. They talk about mutual fascination and share warm looks. These aren’t interviews. They’re conjugal visits. During most of the movie, Jones is shown reshelving books, playing piano, and looking quizzical and hungry. If Franco won’t eat the scenery, let her. Robert John Burke makes out best, lending some moral authority and classical masculinity to his 4,000th role as a law-enforcement professional. We see the conversations between the men, Longo’s trial, plus too many restagings of the murders, and we still have no idea what this movie hopes to make of any of it. The director Rupert Goold shares the screenwriting credit with David Kajganich (it’s based on Finkel’s book True Story), and the movie seems to think that having two men swat around the words “truth” constitutes an investigation of its nature. Really, it’s rhetorical badminton. Filming the process of creation — corrupt and otherwise — requires some sense of imagination and curiosity. I’m afraid that shots of Hill trudging in the snow or Franco sitting in dark profile don’t cut it. Finkel just wants the truth from Longo and is petulant that he can’t have it. Longo understands the concept of truth to be self-servingly pliable. How was Finkel enlightened? How was Jill able to cope with having her home turned into an episode of NCIS? What did the journalist and the murderer get out of their relationship? A book, obviously. But, according to this movie and the title cards that close it out, they also got something less noble: each other. This piece has been updated to correct an erroneous reference regarding the actor who plays Sepideh in About Elly. Golshifteh Farahani plays Sepideh; Taraneh Alidoosti plays Elly.